While normally one might expect high end phones to get the latest and greatest features first, this time we see a bit of a surprising reversal. The Desire 510 is HTC's first 64-bit phone, and the first announced device with Snapdragon 410. For those that aren't familiar with Snapdragon 410, it has four Cortex A53 CPU cores running at 1.2 GHz, along with an Adreno 306 GPU which suggests that it is a mild modification of the current Adreno 305 GPU that we see in the Snapdragon 400. Overall, this should make for a quite fast SoC compared to Snapdragon 400, as Anand has covered in the Snapdragon 410 launch announcement. While it may seem strange that ARMv8 on Android phones is first to appear on a budget smartphone, it's quite easy to understand how this happened. Looking at Qualcomm's roadmap, the Snapdragon 810/MSM8994 is the first high-end SoC that will ship with ARMv8, and is built on a 20nm process. As 20nm from both Samsung and TSMC have just begun appearing in shipping chips, the process yield and production capacity isn't nearly as mature as 28nm LP, which is old news by now. 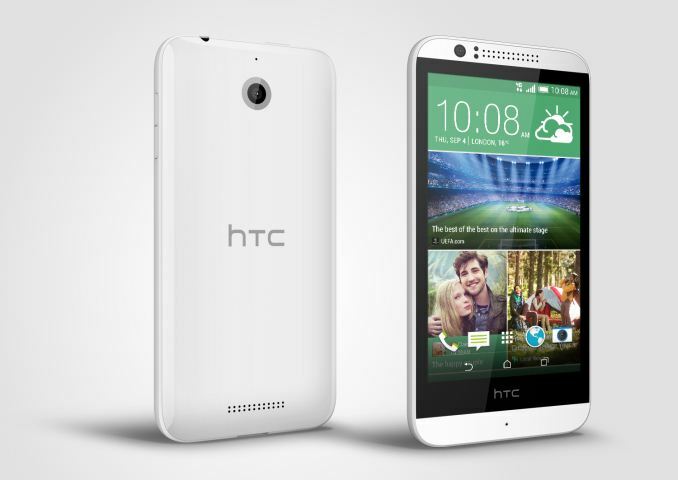 At any rate, outside of the SoC the Desire 510 is a relatively standard budget phone. As this phone ships with Android 4.4 it's likely that it is running in AArch32 mode only, with AArch64 coming with Android L. The display is a 4.7" size, with FWVGA resolution (854x480) which makes for a rather low 208 DPI. This will be the cheapest LTE phone in HTC's product line, and also has support for a Dot View case. I've included the rest of the specs below, but for the most part the key point of interest is the SoC. The only additional comment I have to make is that there is no 5 GHz WiFi. This is probably a WCN3620 part like the Moto G. While there's no word on pricing, HTC will have to price this near the price of the Moto G for it to be reasonably competitive. 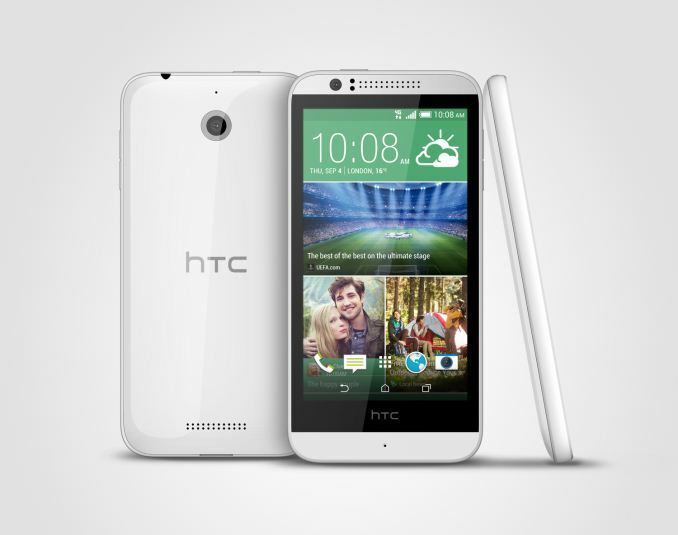 The Desire 510 should find its way to Europe, Asia, and the United States. They dont "need" innovation. They have a large user base, that is willing to buy anything they sell. The iphone is not high end. A 4 inch low res screen (320-ish ppi is low now) with scores of missing features (microSD, wifi ac, wireless charging, dual SIM, NFC, IR blaster and many more) is not high end even if the SoC is fast. I'll give it upper mid-range but not high end. In fact if the iphone had any other brand on it and would be priced at 300$ it would barely sell a million units in a quarter. Nobody sane actually wants a 4 inch low res screen unless it a very cheap device and all they can afford. Everybody is so lost in the marketing BS that the don't dare to look at the actual product. It's toyish tiny and a huge amount of missing features for an outrageous price. I would like to differ, as I'd rather have fast internal NAND at higher capacities than a microSD, and hence willing to pay $200 extra apple premium for that 64GB. Wireless charging would be nice if it was more efficient (like 85%), I also don't need dual SIM (if I travel, I'd just use the new SIM). I haven't had a huge use case for NFC not IR blaster. AC wireless would be nice though for my wifi transfers, but that would also increase end user cost for a compatible router. I agree with you. I am very much anti-apple, but am mature enough to still accept that they make good products for the masses. It's not like they're selling lemons. The idea of microSD on a phone to me, well i just ignore it, i'll always pay more for the additional onboard NAND. And i tried NFC once to transfer a single photo between my phone and tablet, won't be doing that one again. Wireless charging, worthless to me, i'm not that much of a lazy bugger. I like the way Apple vertically integrates the crap out of their products (mostly in software). Samsung, for example, can absolutely do the same, they can collaborate more among their branches (Samsung Mobile, Semiconductor, and Samsung Electronics) and create a more tightly integrated and optimized platform even with Android (just like their SSD solutions). They have top notch and industry leading parts, but the software is holding them back, and Samsung Mobile has absolutely no problem buying lots of competing off-the-shelf parts from others, making a seamless experience among their devices that much harder. I'm not totally sure which would ultimately save them more money (since that's what most companies ultimately want), but since they sell hundreds of millions of devices a year, I'd believe that manufacturing all of their own parts would be more beneficial and cheaper in the longer run since the volume would be so high.. They started out in the right direction with the OG Galaxy S and the S2 following that (albeit their shortcomings), but since then were focused more on brute force specs and marketing, making potentially useful features nothing more than gimmicks. I bet they'll do better at this point cutting funds on advertising and instead focusing more on developing a well integrated top of the line platform that is recycled the following year for mid-range (or minis), and recycled yet again for lower end the year after. They can have as many models as they want with those recycled platforms, except with better software, seamless integration, faster updates, and a much better user experience. That's exactly how Apple recycles their platform in iPads, iPods, Apple TVs, and whatever else iOS devices they have. "AC wireless would be nice though for my wifi transfers, but that would also increase end user cost for a compatible router." You're trying too hard jjj... sounding quite desperate scraping that barrel mate.